Background: Pointed foot deformity and mental retardation are common clinical manifestations in children with spastic cerebral palsy. Comprehensive rehabilitation training is performed in cerebral palsy children with mental retardation, but its clinical effect is not satisfactory. Acupuncture at acupoints related to the motor, sensory, foot-motor-sensory, language and equilibrium areas can promote intelligence and effectively relieve local muscle tension. We propose that acupuncture combined with rehabilitation training mitigates pointed foot deformities in children with spastic cerebral palsy and contributes to the development of intelligence. This prospective, randomized, controlled clinical study will test the above hypothesis. Functional magnetic resonance imaging will be utilized to observe the changes in acupuncture-activated brain regions and to elucidate the mechanisms of acupuncture in treatment of spastic cerebral palsy. Methods/Design: This is a prospective, randomized, controlled clinical trial. Sixty children with spastic cerebral palsy, hospitalized in the Out-Patient Clinic of the Department of Pediatric Neurological Rehabilitation, the First Hospital fo Jilin University of China, will be recruited for trial participation. All subjects will be equally and randomly divided into a treatment group and control group. Patients in the treatment group will be subjected to conventional rehabilitation training after acupuncture. Patients in the control group will receive conventional rehabilitation training alone. The treatment will last for 6 months. Primary outcomes will be Gross Motor Function Measure, ankle range of motion, Gesell Developmental Scale and surface electromyography. Secondary outcomes will be: modified Ashworth Scale of muscle spasticity, Fine Motor Function Measure, Gross Motor Function Classification System, and functional magnetic resonance imaging. Discussion: It is hoped that the experimental results can provide quantitative data for acupuncture combined with rehabilitation training in the treatment of spastic cerebral palsy. Trial registration: Chinese Clinical Trial Registry (registration No. ChiCTR-ONC-15007633) on December 24, 2015. Cerebral palsy in children manifests mainly as motor dysfunction, and is often associated with mental retardation, vision and hearing loss, growth retardation, epilepsy and abnormal behavior (Mukhopadhyay et al., 2015; Badia et al., 2016; Bartlett et al., 2016). Spastic cerebral palsy accounts for 50-80% of cerebral palsy children. Pointed foot deformity and mental retardation are common clinical manifestations in these children (Rosenbaum et al., 2006). Children with pointed foot deformity exhibit pyramidal tract damage and the stretch hyperreflexia is frequently the cause of muscle spasms. These spasms not only cause growth retardation and abnormal posture, but also induce contracture, deformity and pain. The gastrocnemius and soleus muscle spasm often results in ankle plantar flexion and dorsiflexion insufficiency. The heel cannot touch the ground normally, producing pointed foot deformity and reducing the stability of the support surface of the affected foot. This affects the standing and walking abilities of these children (Li et al., 2006). The total prevalence of mental retardation was approximately 70% in spastic cerebral palsy children (Hou et al., 2004). A higher Gross Motor Function Classification System score was associated with a higher proportion of mental retardation (Hou et al., 2004). Krägeloh-Mann et al. (1995) considered that the incidence of periventricular leukomalacia was high in children with spastic diplegia, occurring in 87% of premature infants. When a visual disorder appears after corticospinal tract injury (Nanba et al., 2007), anisometropia, strabismus, low visual acuity, dynamic visual acuity of eye movement, graphic perception, and visual memory may change. These impact the development of intelligence, especially attention, memory and spatial thinking. Preterm birth and low birth weight are risk factors for visual impairment in cerebral palsy children (Zhao et al., 2010). Our previous research has shown that comprehensive rehabilitation or neurotrophic drug treatment for cerebral palsy has a certain promoting effect on the development of intelligence, but we did not study the improvement in pointed foot deformity. Moreover, the therapeutic effects and safety considerations are different between comprehensive rehabilitation and drug treatment. Our previous studies are listed in [Table 1]. Key to treating cerebral palsy is how to simultaneously improve mental retardation and pointed foot deformity. The methods to lessen foot spasm consist of exercise therapy, physical therapy, kreotoxin, surgery, brace, wax therapy and shock wave. However, none is effective alone, so combined therapy is needed. Apart from neurotrophic drugs, comprehensive rehabilitation training is performed in cerebral palsy children with mental retardation, including exercise therapy, occupational therapy, speech therapy, psychotherapy, education and social rehabilitation. 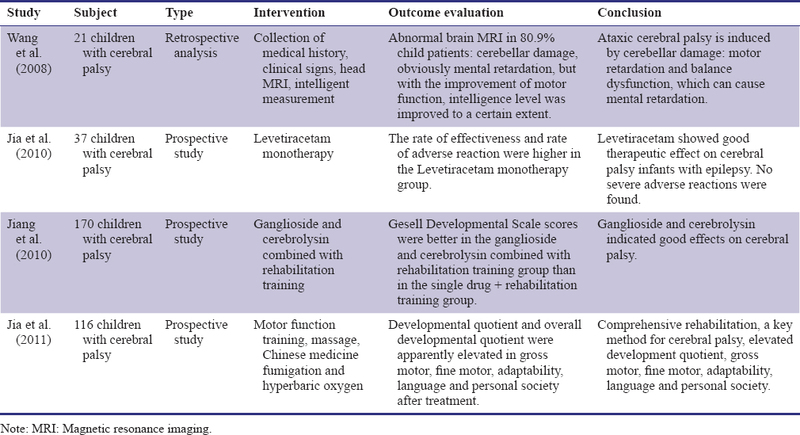 So far there has been little comparison or assessment of their clinical effects (Wen and Dong, 2009). Therefore, the combined application of other methods with rehabilitation training is needed to gain satisfactory effects. Acupuncture has been shown to completely regulate the body's activities, improve movement, intelligence, emotion, physical and mental health (Liu et al., 2010; Zhang et al., 2010; Zhang and Wu, 2012). Xie et al. (2012) verified that acupuncture at acupoints related to the motor area, sensory area, foot-motor-sensory area, and language area could noticeably increase cell viability in the brain and promote the development of intelligence. Acupuncture at Quchi (LI11), Chize (LU5), Shousanli (LI10), Zusanli (ST36), Sanyinjiao (SP6) and Naoqing (Ex-LE16) can effectively relieve local muscle tension and improve abnormal posture. We suggest that acupuncture combined with rehabilitation training can effectively mitigate pointed foot deformities in children with spastic cerebral palsy and improve the development of intelligence. This prospective, randomized, controlled clinical trial will test the above hypothesis. Functional magnetic resonance imaging will be utilized to observe any changes in acupuncture-activated brain regions that might elucidate the mechanisms of acupuncture in treatment of spastic cerebral palsy. This study aims to provide quantitative data for acupuncture combined with rehabilitation training in treatment of spastic cerebral palsy. This trial will observe the immediate effects and long-term effects of acupuncture on pointed foot of spastic cerebral palsy patients and identify any therapeutic effect of acupuncture. This will be a prospective, randomized, controlled clinical trial ([Figure 1]). A family member of each patient will be informed of the study protocols, and will sign with their informed consent. The study will be performed in accordance with the guidelines of the Declaration of Helsinki, formulated by the World Medical Association. Sixty children with spastic cerebral palsy, hospitalized in the Out-Patient Clinic of Department of Pediatric Neurological Rehabilitation, the First Hospital, Jilin University of China, will be recruited to participate in this trial. All subjects will meet cerebral palsy diagnostic criteria (2015), formulated by Children's Rehabilitation Professional Committee of Chinese Association of Rehabilitation Medicine, Rehabilitation Professional Committee for Children with Cerebral Palsy of China Association of Rehabilitation of Disabled Persons, and "China Cerebral Palsy Rehabilitation Guide" Editorial Board. One day before treatment, sixty patients will be assigned a number. The starting point and order of sampling will be arbitrarily determined on a random number table. The number of samples will be selected from the random number table. Sixty subjects will be equally and randomly assigned to treatment and control groups. Electronic medical advice will be issued to the children. Li-li Wang, a study designer, will arrange and control the entire test process. The assessors will not know the protocols. Subjects in the treatment group will receive conventional rehabilitation training after acupuncture. Subjects in the control group will receive conventional rehabilitation training alone. Head acupuncture contains Baihui (DU20), Sishencong (EX-HN1), motor area, foot-motor-sensory area, language area, Mental Tri-Points and Middle Line of Vertex (MS 5). For palsy, we will select the Yang meridian on limbs. Body acupuncture acupoints include Zusanli (ST36), Sanyinjiao (SP6), Naoqing (Ex-LE16), Quchi (LI11), Chize (LU5), Shousanli (LI10) and Hegu (LI4). Acupoints will be selected according to different symptoms: Tinggong (SI19), Yifeng (SJ17), head acupuncture at the vertigo-auditory zone or posterior temporal line for hearing loss, Cuanzhu (BL2), Chengqi (ST1), head acupuncture at the visual zone or upper-lateral line of the occiput for abnormal vision. Acupuncture will be conducted once a day, six times a week. Head acupuncture: 30-60 minutes each; body acupuncture: 10-20 minutes each; 3 months as a course, totally two courses. All disposable needles (0.3 mm × 25.0 mm) will be purchased from Guizhou Andi Medical Equipment Co., Ltd., Guiyang, Guizhou Province, China. Exercise therapy consists of Vojta therapy, Bobath neurodevelopmental therapy and Ueda therapy, once a day, 30 minutes each, 6 days a week, for 6 months. Occupational therapy addresses movement (control of upper limb muscle), sensation (normalization of sensory stimuli), and cognition; once a day, 30 minutes each, 6 days a week. Speech therapy addresses dysarthria, pronunciation and cognition, once a day, 30 minutes each, 6 days a week. Physiotherapy includes electrical nerve stimulation therapy and wax therapy, once a day, 30 minutes each, 6 days a week. Massage therapy comprises pressing, kneading and pricking, once a day, 30 minutes each, 6 days a week. The sixty patients will have their own follow-up card, and will be followed up by telephone at 6 months after treatment. Follow-up results will be recorded on the follow-up card and follow-up record sheet, and then loaded into the computer for storage. The reasons why patients drop out or have poor compliance will be recorded in the case report form. We will as far as possible contact patients to gain understanding and support, complete the evaluation, fill in the follow-up record, record the time of the last treatment, and finally retain the electronic version of the data. Trial outcome measurement schedule is given in [Table 2]. Two researchers will separately copy the required information from the electronic medical record and fill in a table, once a month. After copying, the data will be dated and loaded into the computer for storage. The investigator, who is in charge of group assignment, will create a table to summarize the data of every stage. After the follow-up, the data from the two tables will be checked. The blind codes will be preserved, and the database will be locked. After locking, the data file cannot be changed and the database will be saved for future reference. In the first unblinding, the treatment and control groups will be named as A and B, and the database will be analyzed by biostatistics professionals. Afterwards, the second unblinding will be conducted. Data will be analyzed with SPSS 15.0 software (SPSS, Chicago, IL, USA). First, we will apply a statistical description of the data. Measurement data that obey normal distribution will be expressed as mean, standard deviation, minimum value and maximum value. Data that do not obey normal distribution will be expressed as the lower quartile, median and upper quartile. Numeration data will be presented as constituent ratio. The baseline data of both groups will be analyzed with non-parametric Mann-Whitney U test and chi square test. The difference of ankle range of motion and developmental quotient will be compared between the two groups using non-parametric Mann-Whitney U test. McNemar's chi square test will be used to detect modified Ashworth Scale of muscle spasticity, Gross Motor Function Measure, Fine Motor Function Measure, Gross Motor Function Classification System, and gait analysis between groups. Alpha will be set to 0.05. In strict accordance with a randomized controlled design, primary measures used in this trial, including Gross Motor Function Measure, ankle range of motion, Gesell Developmental Scale and surface electromyography, are internationally recognized indicators to judge abnormal posture and intelligence in cerebral palsy patients. The changes in ankle range of motion will be observed to further identify the improvement in pointed foot deformity. In this trial, acupuncture combined with rehabilitation training will be applied to treat spastic cerebral palsy in infants to gain a better therapeutic effect. Functional magnetic resonance imaging will be employed to observe the activation of motor area and language area after acupuncture and rehabilitation training. This may point to the mechanism of action of acupuncture with rehabilitation training on cerebral palsy in infants. LLW designed and participated in this trial, and obtained final test data set. LD assessed indexes. LS collected and analyzed statistical data. HYD retrieved references and wrote the paper. FYJ served as a principle investigator. All authors aproved the final version of the paper for publication. Badia M, Begoña Orgaz M, Gómez-Vela M, Verdugo MA, Ullán AM, Longo E (2016) Do environmental barriers affect the parent-reported quality of life of children and adolescents with cerebral palsy? Res Dev Disabil 49-50:312-321. Bartlett DJ, Galuppi B, Palisano RJ, McCoy SW (2016) Consensus classifications of gross motor, manual ability, and communication function classification systems between therapists and parents of children with cerebral palsy. Dev Med Child Neurol 58:98-99. Dukes L, Buttery TJ (1982) Comparison of two screening tests: gesell developmental test and meeting street school screening test. Percept Mot Skills 54:1177-1178. Editorial Board of Chinese Journal of Pediatrics the Subspecialty Group of Neurology, Pediatric Society, Chinese Medical Association (2005) Definition, diagnostic criteria and clinical types of cerebral palsy in children. Zhonghua Erke Zazhi 43:262. Hou M, Sun D, Shan R, Wang K, Yu R, Zhao JJ, Jiang YP (2004) Comorbidities in patients with cerebral palsy and their relationship with neurologic subtypes and Gross Motor Function Classification System levels. Zhonghua Erke Zazhi 48:351-354. Jia FY, Liang D, Chen YB, Hao YP (2010) Effect of levetiracetam monotherapy for epilepsy combined with cerebral palsy in toddler. Shiyong Erke Linchuang Zazhi 25:943-949. Jia FY, Wang JT, Li HH, Hao YP, Li H, Liu B (2011) Effect of comprehensive rehabilitation on developmental quotient and intelligent structure of children with cerebral palsy. Zhongguo Fuyou Baojian 26:2759-2760. Jiang HY, Jia FY, Liu SC, Liang D (2010) Comparison of therapeutic effect of ganglion glycosides and Shi Pushan on cerebral palsy. Zhongguo Fuyou Baojian 25:844-884. Kolind S, Seddigh A, Combes A, Russell-Schulz B, Tam R, Yogendrakumar V, Deoni S, Sibtain NA, Traboulsee A, Williams SC, Barker GJ, Brex PA (2015) Brain and cord myelin water imaging: a progressive multiple sclerosis biomarker. Neuroimage Clin 9:574-580. Krägeloh-Mann I, Petersen D, Hagberg G, Vollmer B, Hagberg B, Michaelis R (1995) Bilateral spastic cerebral palsy: analysis from a representative series of 56 cases. Dev Med Child Neurol 37:379-397. Li H, Ding JX, Zhou AY, Huang DF, Jiang Q, Yin YD (2006) Gait analysis through plantar pressure measurement in children with spastic cerebral palsy. Zhonghua Wuli Yixue yu Kangfu Zazhi 28:818-821. Liu L, Liu LG, Lü M, Ran WJ (2010) Clinical observation on infantile cerebral palsy treated with quick meridian needling therapy plus scalp acupuncture. Zhongguo Zhen Jiu 30:826-829. Mishra C, Ganesh GS (2014) Inter-rater reliability of modified modified Ashworth scale in the assessment of plantar flexor muscle spasticity in patients with spinal cord injury. Physiother Res Int 19:231-237. Mukhopadhyay R, Mahadevappa M, Lenka PK, Biswas A (2015) Therapeutic effects of functional electrical stimulation on motor cortex in children with spastic cerebral palsy. Conf Proc IEEE Eng Med Biol Soc 2015:3432-3435. Nanba Y, Matsui K, Aida N, Sato Y, Toyoshima K, Kawataki M, Hoshino R, Ohyama M, Itani Y, Goto A, Oka A (2007) Megnetic resonance imagine regional T1 abnormalities at term accurately predict motor outcome in preterm infants. Pediatrics 120:e10-19. Rosenbaum P, Paneth N, Leviton A, Goldstein M, Bax M, Damiano D, Dan B, Jacobsson B (2006) A report: the definition andclasification of cerebral palsay April 2006. Dev Med Child Neurol Suppl 109:8-14. Wang Z, Li J, Jia FY, Li YT, Li YK (2008) Clinical and intellectual characteristics of children with cerebral palsy of ataxia type. Zhongguo Kangfu Lilun yu Shijian 14:184-185. Wechsler D (1939) Wechsler-Bellevue intelligence scale. New York: The Psychological Corporation. Wen YQ, Dong XL (2009) Advances of studies on acupuncture and moxibustion for treatment of language disorder in children with cerebral palsy. Zhongguo Zhen Jiu 29:772-774. Xie XS, Su AF, Su XH (2012) Scalp acupuncture combined with manipulation for treatment of children with cerebral palsy in 44 cases. Xiandai Zhongxiyi Jiehe Zazhi 21:1186-1187. 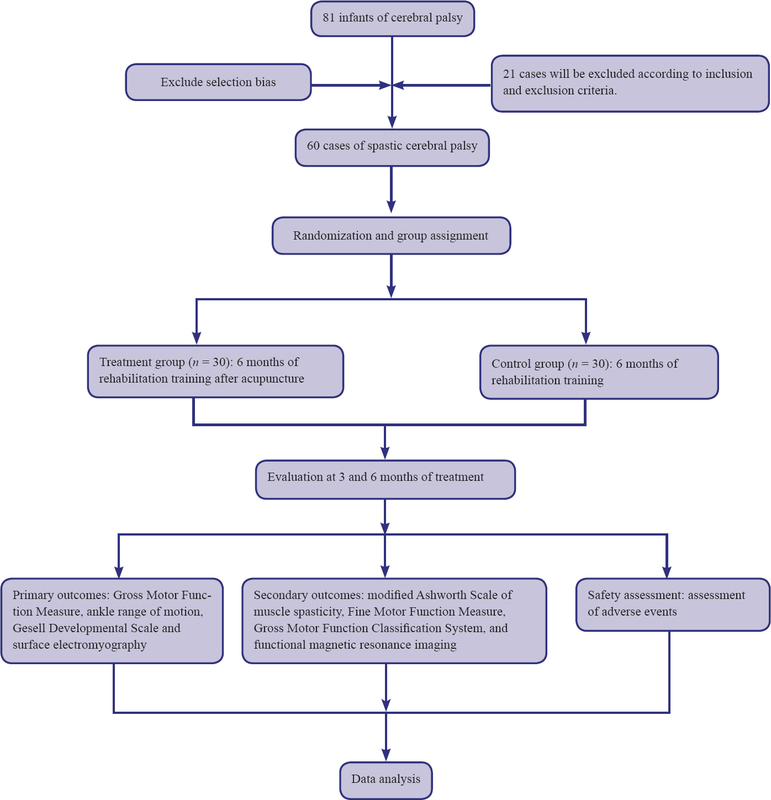 Zhang HY, Lu SF, Xiao N (2010) Effects of mild warming moxibustion on acupoints Shenque (RN8) and Guanyuan (RN4) for prevention and treatment of recurrent respiratory tract infection in children with cerebral palsy. Zhongguo Zhong Xi Yi Jie He Za Zhi 30:935-937. Zhang XJ, Wu Q (2012) Impacts on IEMG of gastrocnemius muscle for children with cerebral palsy treated with different intervention order. Zhongguo Zhen Jiu 32:301-304. Zhao JH, Hou M, Wang Q, Zhong ZB, Sun DR (2010) The clinical features of visual dysfunction in child with cerebral palsy. Zhonghua Wuli Yixue yu Kangfu Zazhi 32:915-918.